It’s a fair question, and has important implications. Does this material really provide a window into the minds of the most humble people in Tudor and Stuart society, or were reading and writing skills the preserve of the more affluent, or at least the middling, classes of society? 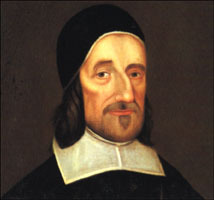 After all, in 1691 the puritan writer Richard Baxter had described his lower-class neighbours as ‘the rabble that cannot read’. Was this fair? Back in the 1970s the social historian David Cressy came up with a cunningly simple way of measuring the literacy skills of our early modern ancestors: counting the percentage of people who could sign their name to witness statements that they gave before the courts. Witnesses in court cases were drawn from across the social scale, and included men and women, so the results could be broken down by class and gender. The methodology was simple: given that it was customary in the period for people to learn to read before learning to write, it was assumed that people who could write out their own signature were fully literate: they would have learned to both read and write. Given, Cressy argued, that there was no particular stigma attached to not being able to sign your own name, it was unlikely anyone would have learned to do this specific task if they were not actually able to write. Those who could not write out their name, who instead usually simply signed documents with a cross, were counted as illiterate. The results of this approach suggested that in the seventeenth century only roughly 30% of adult men were fully literate, and only 10% of women were. When broken down by social group, the results show considerable divergence across the social scale. Almost 100% of the gentry were literate. The number was around 60% for yeomen (i.e. wealthier farmers) and tradesmen: the groups historians tend to see as the ‘middling sort’ or middle class. But for husbandmen (poorer farmers) and labourers, the percentage that could read and write was only between 15-20%. Put crudely, all gentlemen were fully literate, just over half of middling class men were, but less than 1 in 5 men from the lower classes were. For all classes of women the figure was more like 1 in 10. This might seem to suggest then that reading and writing materials that survive from this period are indeed artifacts of upper and middle class male culture, not the culture of more humble men and women. But there are some problems with these statistics. For a start, as several historians, including Cressy, have pointed out, they are underestimates of reading ability in particular. It was quite common even for the children of the poor to have some schooling, and hence to learn to read, only to be taken out of school at the age at which they were deemed old enough to work on the family farm or in its workshop: around 7 or 8 years old. It was at this age that the teaching of writing skills typically began. It is highly likely then that many people who could not write their name, and would thus be counted as illiterate in these calculations, could in fact read: they were partially literate. Indeed, some historians have suggested that these figures are therefore a massive underestimate of reading ability in the period. 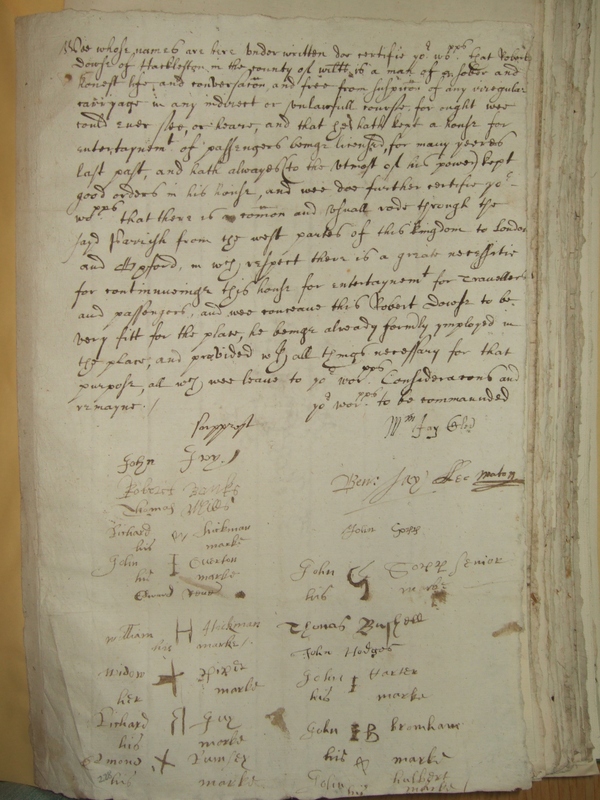 Moreover, in a recent class I showed some examples of seventeenth-century signatures (not taken from witness statements, but from some petitions by villagers to have alehouses either set up or closed down in their locality) to highlight how this methodology works. In the course of the discussion we identified a number of issues with this process of counting signatures that suggests not only is there a problem here with underestimating reading ability, but that the system of sorting them into ‘signatures’ and ‘crosses’ may well be underestimating writing ability too. What should we make of this? This is not a full signature, so in Cressy’s methodology William Hickman would have been filed under ‘illiterate’. But does his use of an initial suggest he had a modicum of ability with the quill in hand? Perhaps he had stayed in schooling long enough to begin writing lessons, but had not fully mastered the art before being called back to lend a hand tilling the soil. If so, he would almost certainly have been able to read. Or maybe he had asked a literate associate, a tradesman from the village, to teach him the basics, so he could at least offer an initial rather than a cross. There may not have been a stigma attached to being unable to sign in full, but it may nonetheless have been important to Hickman to show that at least his literacy skills were a step up from poor Widow Piper’s. This was, after all, a society obsessed with status at every level. First of all, you need to ignore the large cross that looks like a big lower case ‘q’. This is in fact the mark of the previous petitioner, who has signed in the wrong place (easy to do, presumably, if you cannot read). Well, I say ignore, but first note that the cross has been made without removing the quill from the parchment, which could indicate a greater degree of skill than a two stroke cross. It’s joined-up handwriting. Even simple crosses, then, can reveal a diversity of calligraphic ability. Perhaps this is being too fanciful. Is it really the same hand as the first misspelled ‘Geore’? The ‘G’ is certainly not identical, but then would we expect an inexperienced writer to consistently produce identical characters? I admit that we can’t be sure, but even if we put this example aside we can see that the range of signatures on these petitions reveal subtle differences in writing ability: even two simple crosses can be compared and contrasted to tell a story about the varying level of skill with which petitioners could handle a quill. This is important because it demonstrates to us that these gradations in ability mattered to ordinary people at the time: many signatories showed great determination to demonstrate that, with their use of an initial, for example, they were not on the bottom rung of the literacy ladder. It suggests that status, and its handmaiden stigma, clung closely to the literacy abilities of even relatively humble people. I may be pushing this material too far, but I think these signatures are fascinating. Using them to produce broad statistical estimates of reading and writing ability in the period is, undoubtedly, very useful, but reading them closely has the potential to reveal so much more about the spectrum of literacy that existed in this society. Sorting these signatures into the ‘literate’ and ‘illiterate’ results in the lumping together as ‘illiterate’ many people who would in fact have had a wide range of at least some reading and writing skills. An illiterate rabble they were not. David Cressy, ‘Levels of Illiteracy in England, 1530-1730’, The Historical Journal, 20:1 (1977). See for example Margaret Spufford, ‘First Steps in Literacy: The Reading and Writing Experiences of the Humblest Seventeenth-century Autobiographers’, Social History, 4 (1979). This entry was posted in History, Theory and methods and tagged found art, penny merriments, pop culture by manyheadedhailwood. Bookmark the permalink. Great post Mark – this is a really important question for so many historians. Peter Foden (@PeterFoden) on twitter had an excellent question that I am relaying: personalized marks give way to anonymous & demeaning X in the nineteenth century – does anyone have any idea of why this might be? Lots of people did simply sign with an anonymous cross even in the seventeenth century, so that is not new: the disappearance of more personalised marks could be a nineteenth century development, but I wouldn’t know why. Any eighteenth or nineteenth century historians out there have any ideas? Perhaps it depends upon the point at which marriage documents were kept securely, and therefore (maybe!) due to restricted space on the certificate, a necessity to simplify the process by requesting simply an ‘X’ by those unable to write their names. I don’t regard myself as a historian – I’m involved in ancestry issues and note that even in the 1880s, some of my ancestors were represented by ‘X – his/her mark’ on their marriage certificates. Very interesting ideas that I hadn’t thought of before. You’ve also shown up another potential problem with printed editions of manuscript sources. Printed protestation returns tend to only indicate signature or mark without describing the marks. It seems that signing a document was a special event for poor people. I get the impression that the elite weren’t as bothered about it. Was there a difference between learning to read print and manuscript at the time? They’re different skills now but were they then? I would guess that reading print and manuscript were divergent, but not separate, skills. Some seventeenth century witnesses in the High Court of Admiralty stated that they could read, but not ‘written hand’ (usually when being questioned about legal maritime documents – account books, bills of lading, and so on). One claimed that, though he could not read or write, he was as fitting as anyone else to be a boatswain, a role that generally included some recordkeeping. I would say this supports Mark’s argument about the complexity of literacy levels and is implications for status. Thanks both – for the question and the reply respectively. I’m not certain about the different reading skills, but Richard’s example suggests they were different skills to me. That interesting example of Richard’s may also relate to a point raised by Sara Pennell on twitter: that some people may have had an ability to recognise or write numbers without being fully literate. It would, for instance, have been a useful skill for cooking, and many other tasks and jobs involving measuring or indeed transactions. Perhaps your boatswain could do some basic record keeping but not much else, and it seems likely to me many others would have had a similar skill set. Fascinating and enjoyable post, Mark, showing — among other things — that simple statistical analysis can rarely give us the accuracy in assessing individuals as representative of larger groups as many would like. Can I add a couple of random points? 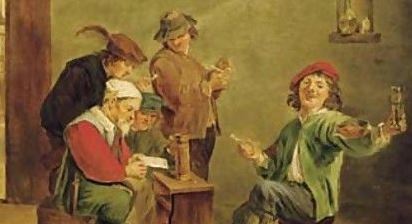 The Teniers painting of ‘Peasants Reading a Letter…’ It seems to me that one can interpret this in at least a couple of mutually incompatible ways. The individuals looking over the letter could be really reading it, or they could be ‘reading’ it by having one individual (the one holding the letter) actually read it out aloud to all of them. Thus, they might all be able to read; or just one or two; or even none, if the painting’s title is in fact satirical (Teniers’ work sometimes has bite, as in his Costumed apes having a meal). The actual signatures and ‘markes’ are intriguing. For example I wonder if Paull Sayer of Monksilver’s splodge can’t be interpreted as his initials (reversed P and cursive S); age or infirmity could well have caused him grief, and if he was following a long-established family trade as a sawyer RSI could have made quill-holding near impossible. And there’s certainly a story to be teased out of the repeated George ‘Middleton’ attestation — your deduction is certainly very plausible. Thanks for these comments, very interesting. My take on the Teniers is that it is one individual reading aloud to the others – a common practice which also complicates the categories of ‘literate’ and ‘illiterate’: if you knew someone who could read for/to you then you had access to the written word even if you were unable to read. I like your theory about Sayer – and the more I look at it the more I think it is an attempt at an initial or a distinctive mark gone wrong/that has deteriorated with age, rather than just a squiggle. I really enjoyed this – it is fascinating to get a glimpse, however speculative, into the lives, emotions, and experiences of normal people so far removed from our time. I’m really glad you enjoyed it. One of the things I really like about these signatures is that they are a very rare example of the lower classes literally leaving a mark on the historical record. Even when we have versions of their words they have usually been written down by a scribe/court clerk. Here we have direct examples of them personally recording their own ‘words’, even if that is only a cross or an initial. Interesting post. I’d suggest extending your question though. If we (reasonably) argue for a spectrum of writing ability, we should presumably do the same regarding reading. Your posts constructs a spectrum of writing ability, but then uses it to conclude that if they could write, they could also read. But of course as teachers we know there are vast differences between the readability of different documents (e.g. the quantified ‘grade-level’ of a particular piece of prose), and of students at different levels of reading ability. (And I’m probably not the only professor to automatically assume a student can’t read well if their handwriting looks like a 3rd grader’s.) My undergraduate students, for example, have a hard time with the vocabulary and grammatical constructions of 17C English. So I wonder what it even means to say a peasant could sign his name with the ‘incorrect’ spelling yet be able to ‘read.’ What kinds of documents could he read? How many of the period’s written documents could he read? Maybe there were only specific scenarios in which a barely-literate individual would use his/her reading ability? (Perhaps looking at the coping skills of modern adult illiteracy might provide some insight.) I’m amazed, looking at late 17C newspapers and pamphlets discussing high politics, war, foreign policy…, at how sophisticated their language (e.g. sentence construction) and argumentation was. I’m skeptical that many people today can understand and follow their arguments, which makes me equally skeptical that most 17C people whose schooling ended at 7 or 8 years old would be able to read and understand many of the publications available back then – I don’t know if modern education is comparable, but that would be 3rd grade or so. What’s at stake in saying non-writers could still ‘read’? Has anyone done something as simplistic as run old English documents through grade-level software to get a sense of how ‘sophisticated’ various genres of literature were? Might make for some interesting comparisons with modern prose. Maybe historians of reading have already beaten this horse to death? Thanks for these really helpful comments. My argument here simply follows the common assumption made by historians of early modern literacy that writing ability signified reading ability, but of course you are right to suggest that there was likely an equally complex spectrum of reading ability and skills (indeed, as the comments above suggest, we might distinguish between the ability to read manuscript and to read print, or the ability to recognise numbers). It also seems quite possible that a tradesman could have learned to recognise a range of words that were particularly useful for reading documents relating to his trade, but have been unable to digest a more sophisticated chapbook. The problem, of course, is that this range of reading abilities – especially for the lower classes – are even more difficult to asses from surviving sources than are writing skills. I’m sure there is a literature on the history of reading that has some answers – its something I’ll be chasing up. I agree with this to some extent: it is the worst sort of romanticism to simply assume that ordinary people in the past were as intellectually engaged as we might like them to be. That said, I’m constantly impressed when reading, say, court depositions of seditious speech cases about how coherent and indeed ‘sophisticated’ their arguments can be. Moreover, I think part of the reason why modern students have trouble with C17th printed language is because much C17th print actually followed oral forms (see Adam Fox’s book: Oral and Literate Culture). You can see this clearly in religious writing (which often was based on preaching), many pamphlets (which often read like stream-of-consciousness rants in a pub argument) and of course broadside ballads (which were meant to be sung). So those types of sources may have actually been _easier_ for a semi-literate person used to oral culture, than they are for a highly literate modern reader. ..but I hadn’t thought of the cross as a default mark. Variation in signers’ marks made me think of merchants’ marks – and how similar marks were also used by tradesmen and artificers etc. Thanks for a great post! I love to think about the implications of signatures/marks etc. In one church court deposition on which I’m currently working (a will dispute from 1627), it’s reported that the testator (who was by this point in a lot of pain), when prompted to sign his will, said ‘before I cann [i.e. could] well endure to writte my name but I will sett my marke therevnto’, which suggests to me that people may have employed both a mark and a signature interchangeably depending perhaps on the situation and/or their physical ability to sign. In this case, the testator’s lack of signature on the document proves a point of contention in terms of the validity of the will, as one of the witnesses is keen to state that ‘he knew the testator to be an Indifferent Clarke and that he did vse to write bandes and bills and other Convayaunces for his neyghbours there about and noe question when occacion serued wrott his name at length’. 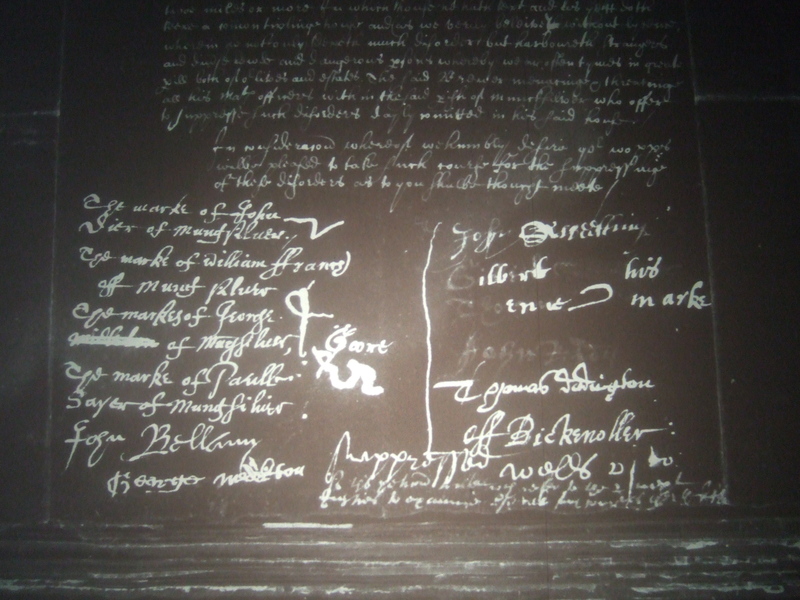 So, in cases where people were known to have been literate enough to construct other documents and to sign their own name, there seems to have been a definite hierarchy in terms of signature/mark and their relative ‘value’. Particularly in the case of such an important document as a last will and testament, leaving a mark could throw into question its legal validity, when it was known that the testator had previously been capable of leaving a signature. Thanks Steph, that’s a fascinating case. The fact that literate individuals might revert to a simple cross in old age is something well acknowledged in the literature on this, as you probably know (Cressy, for example, compares signature literacy derived from wills to that derived from depositions, and finds it to be lower, which is clearly not a result of the likely social status of testators, who were more likely to be affluent than poor). What I think is really striking about your case is that line that there was ‘noe question when occacion serued [he] wrott his name at length’, suggesting that the context also dictated whether someone used a cross or a full signature. My sense is that for a petition you would want to emphasise your status to add weight to the plea, so that you would deploy your ‘best’ signature (which fits my theory about George Middleton striving to sign in full). Would the same apply for a court deposition? Its certainly worth thinking about further. I’ve always been concerned that the literature on early modern literacy missed the essential point about testamentary signature: it was not initiated and executed by one individual but usually by more than one. In short, the ‘mark’ is really more like a confirmation that ‘Yes, I am here and I’m in agreement’, after the name had been written by someone else.The idea that we carry with us is that ‘signature’ is a private thing, part of us and very much our property, on which basis the signature is the mark that shows that we indeed agree. Early modern Britons simply did not see it that way and not because they were necessarily illiterate, but rather because legal process allowed one – expected one – to confirm identity, not assert it. Thanks Mark. That distinction between confirming and asserting identity is useful I think, but it is nonetheless the case with petitions that some individuals choose to sign in full rather than simply leave a mark of confirmation. Doesn’t that suggest that they did see a difference between confirming and asserting their identity through a signature? Otherwise, why not have a clerk draw up a full list of names and have everyone just apply their mark? I was discussing this with Andy Wood and Andy Burn last week and they mentioned that they had seen ‘marks’ that were closely associated with the person’s trade. If I remember correctly, AW mentioned that some Derbyshire miners signed with a little picture of a mining pick and AB had found Newcastle keelmen signing with a basic sketch of a ship. Ooo – fantastic. I think I may have been aware if this, possibly from talking to Andy Wood. That’s another thing for me to keep an eye out for. I have only just been made aware of this post and read it with interest. I would take issue with you on a couple of points. In his book (‘Literacy and the Social Order’) David Cressy goes to some lengths to explain why petitions are not reliable sources on which to base conclusions about illiteracy; ‘The main difficulty with petitions and remonstrances lies in our ignorance of the circumstances in which they were circulated […] petitions were free of controls. The organizers wanted a large number of names in a hurry and may not have minded if the collection was casual or selective’ (p71). Instead, he used sources for which signatures were collected under supervision such as the Solemn League and Covenant (p69). Apart from that, on p60, he shows some of the wide variety of marks that were made. On the basis of that I wonder if it is wise to suggest that the cross was the default mark. On pp57-58 he explores the sometimes complex marks that were made, including those used by Shakespeare’s father. On the question of being taught to read and write, there are a couple of points: my research topic is grammar schools of the late seventeenth century and, in the past few years, I have gathered information about a variety of different schools. One of the things that I have found is that there were petty schools that taught the two skills separately. At Putney, for example, parents were charged one fee if they wanted their child to be taught to read and a higher fee if they wanted the child to be able to read, write and do arithmetic so I would argue that reading and writing were separate skills and taught as such. But there were many ways in which children were taught to read: Adam Martindale was taught to read by his sister’s boyfriend. It’s also worth remembering that school attendance was, in many cases, very casual. Even into the nineteenth century, schools were reporting that children attended for only a few months – the Royal Lancasterian School in Birmingham, for example, had children attending for only about 16 months on average in 1837. It seems likely that attendance at Petty schools in the seventeenth century would have been just as haphazard. Reference: David Cressy, ‘Literacy & the Social Order Reading & Writing in Tudor & Stuart England’ Cambridge University Press 2006 edition. Thanks for these comments Ken. I’m not sure we are at variance particularly – I would agree that petition signatures are not a straightforward indicator of literacy ability (and this is true of many other types of signed documents too). My point here is that they can tell us a lot about the spectrum of literacy skills in this society, not that literacy rate statistics can be reliably garnered from them. I would also agree that marks were much more varied than the widely held assumption that a cross was the default allows – since writing this post I have collected a very wide and eclectic range of marks. Your material relating to variable payments for learning different skills is very interesting, and confirms the point I make here about them being taught as such (and often sequentially). The question of how people learned to read is a really fascinating one: as you say, it could be quite varied and sporadic, and this no doubt helps explain my main point that reading and writing skills were much more varied than a simple literate v illiterate classification allows. Have you published any of work on grammar schools? I would be interested in it. Not as yet. I’m researching a very large archive at present. I will be delivering a short paper at a postgraduate symposium in Exeter later this year but that will be looking at the seventeenth century networks that were used to gather the data rather than any detail about the schools. It will be a while before I’m able to publish anything more than what amounts to anecdotal material arising out of the archive.